Why do plastic film producers, converters and purchasers use profilers? A plastic film profiler such as the SolveTech PR2000 takes a strip of film and pulls it through a measurement head which takes a thickness measurement. The purpose is to show the thickness variability of the film in the cross web or down web direction. In the case of the PR2000, it takes a reading every 1/8th of an inch and plots the data on a graph. The alternative to profiling is an inexpensive pair of calipers, and many producers use this solution. It is simple and low tech, and it does not require much capital investment. However, most of the world’s top producers have adopted using profiler technology, but the question is “Why?”. 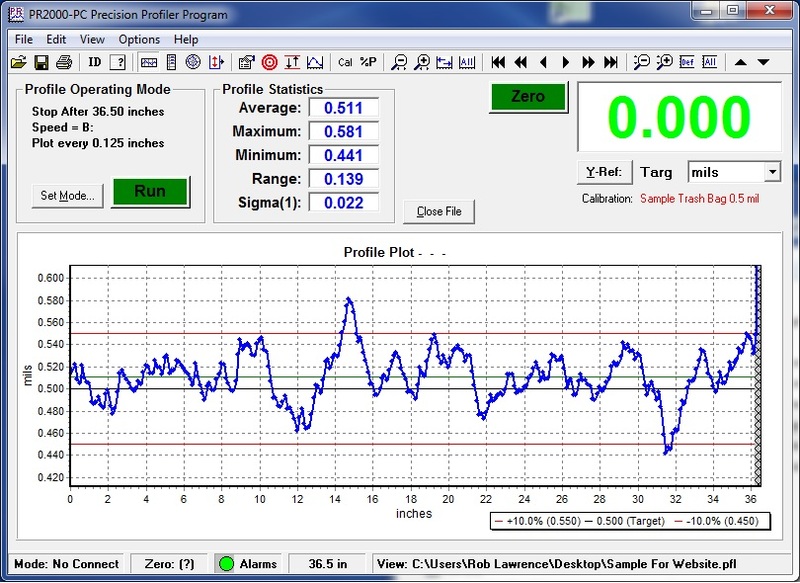 The profiler can collect 1440 data points a minute and quickly profile long strips of film. To do this by hand with much fewer data points is tedious and could easily take 10 to 15 minutes to measure and record the data. The profiler uses non contacting technology which is approximately 25 to 50 times more accurate and repeatable than a micrometer. This means you can trust the results without having to run multiple times. This is especially valuable for thin films where the micrometer’s accuracy can be only +/- 10% of the material thickness. The high number of data points means you get a complete picture of the material variation and a good average thickness. This is not practical to achieve with a micrometer. The profile presents an easy to interpret visual of the variation and the location of different variations on the sample. This again would take a lot of time an effort to produce using a micrometer. Die bolt patterns can be overlaid and it is clear where to make adjustments to the process. How do producers use the profiler? Since plastic film is produced from an extruded die, there can be variation in the cross web or machine direction. Many producers want to know their variation and control it to the best of their ability. The profiler helps them see the quality of the material they are producing. Defects and higher than expected variability can cause material weakness and problems in converting and sealing. A sample strip is taken and run through the profiler, and now they have a clear picture of what is going on. So how do producers use the information to their benefit? A unit is placed on the production floor to help production set up and monitor their extrusion process. In some cases, a producer may not have any on line gauging equipment. The profiler is an economical alternative to putting gauges on every line since one profiler can service the entire production floor containing multiple lines. Before a producer releases material to a customer, they typically want to check that the material meets the specification under which it was sold. Thickness and variability are often key specifications and the profiler delivers the information quickly and easily. Many material producers or converters want to inspect incoming material to make sure it meets the requirements the producer has specified. Verifying the material is correct can prevent problems in converting or processing. It is also a great tool for evaluating material suppliers. Some of the benefits the PR2000 are not easily quantifiable, but it can be easy to see that often the ROI is under six months. These are some of the ways the PR2000 can help a producer save and make more money. How does a producer know if the film he is producing in China matches what is produced the in US? In summary, the profiler is an upfront capital investment, but it can pay big dividends for producers. We offer free sample testing and rentals for qualified customers. SolveTech’s PR2000 is the premier profiler on the market, and we are happy to show you why. We hope you found this article helpful, and please do not hesitate to contact us with any questions! SolveTech, Inc. is based in Wilmington, DE USA and has been making thickness gauging solutions for over 35 years. They specialize in proprietary capacitance based non-contacting measurement systems for non-conductive materials and offer free sample testing for equipment evaluation. For more information, contact us a info@gauging.com or call 302-798-5400.